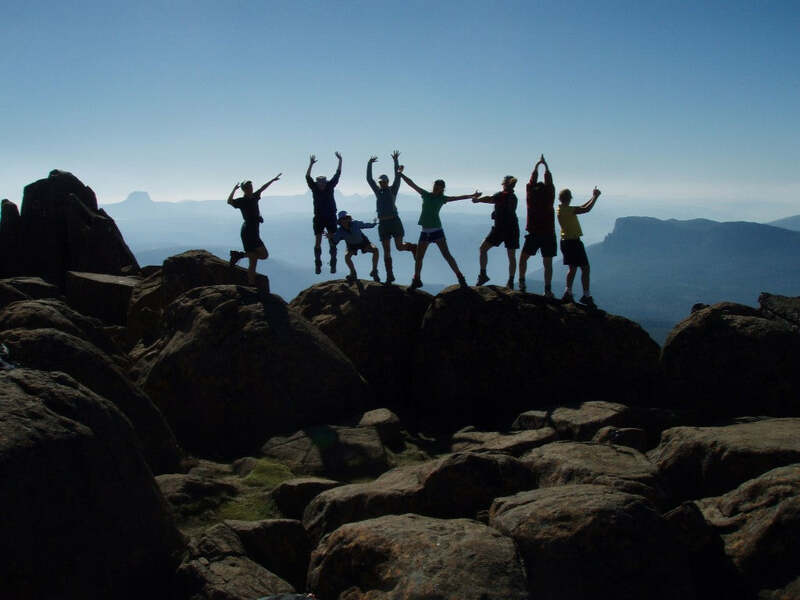 Tassie Adventure Club for teens. As an Outdoor Education teacher at a school in Australia I often get asked by parents as to what is the best pack to buy for their teenage son or daughter. My response is typically exactly the opposite of what they want to hear. There are those who want me to name a particular brand and exact model (usually the one with the most bells and whistles on it that looks really fancy and goes by a cool name of an impressive Himalayan mountain); and then there are those who want me to reassure them that buying a cheap pack is totally okay and justifiable. Instead I explain what not to buy, and I often discourage parents from buying anything–that is until they can be sure that they are spending their money wisely and that it is a pack that is going to be of significant benefit to their teenager. Lightweight backpacking for teenagers isn’t about buying bells and whistles; it’s about keeping it simple. The more compartments, pockets, zips, straps and accessories the item has, the less I endorse it. All these “extras” complicate packing and waterproofing of gear and add up to more things that can go wrong and obviously also add up to unnecessary additional weight. Likewise, only carrying the essentials makes life on the track much less complicated. Teens love living simply. Sometimes they do need to be reminded of this and it takes a little time, but ultimately it is less stressful for them and reminds them of the truly important things in life. My primary goal when teaching youth and leading them on two-week expeditions is to have them develop a passion for the natural world. The easiest way to put teenagers off enjoying the outdoors is to strap ridiculously heavy packs on their back and march them off into the distance. I have certainly made this mistake during my career, but it is something I try really hard to avoid these days. Having a very specific equipment list can really help here as it helps avoid the situation of well-intentioned parents and nervous students throwing all the superfluous “just in case” items in that are actually not necessary. 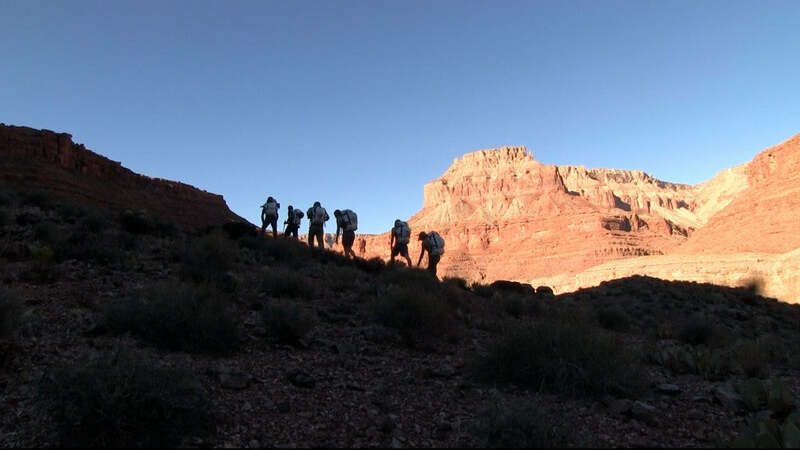 Group of teens in the Grand Canyon. Working and adventuring in the wilds of Tasmania week after week is really hard on gear, as our vegetation and rocks are right up there in terms of the serious abrasion factor. Likewise the teenage boys I teach are often incredibly tough on gear–much more so than the average adult. I often meet many people on the track and at campgrounds who argue that ultralight gear is inherently fragile, and this leads many to think that it is unsafe to carry lightweight gear or that it will fall apart after only a couple of trips. These folk though have most often not seen the incredible benefits of modern ultralight materials such as Cuben fiber and Dyneema. Fortunately, these days you can now buy gear that is both incredibly light and extremely durable. At the school I work at, we have a number of Hyperlite Mountain Gear packs that we loan out to students; they are particularly advantageous for our smaller framed students who struggle when overloaded with traditional large, heavy canvas packs that are so popular where I live. In this case, going lightweight not only increases the enjoyment factor for them but significantly reduces the injury risk factor too. Often it is natural for the smallest or largest student to be massively overloaded relative to their size, strength or fitness and so solving this problem really helps the entire group. I tell my students this before every trip. Admittedly most don’t, but those who do really benefit from this habit as it becomes blindingly obvious as to what is excessive in the weight factor. From this, I then recommend they develop a long-term plan for ultimately going lighter. It took me a couple of years to eventually get the gear I needed to go light, and I certainly do not expect my students to be able to go ultralight on their first major outing. Most students cannot afford to buy every latest and greatest ultralight piece of kit. However, if they and their parents think carefully about such purchases over several years, they can be set up for a lifetime of enjoyment of exploring the amazing natural world that we live in. When you focus on keeping the weight down on the big ticket items like packs, shelters, sleeping mats and a sleeping bag, the rest is easy. When buying gear don’t compromise on safety. If you are going to buy an essential piece of outdoor kit such as a pack my advice is to spend the money, buy the absolute highest quality you can afford and only buy once. If you cannot afford to buy really good gear then don’t buy at all. Instead initially borrow off relatives, friends, school/college or hire gear from a reputable specialist outdoor store. Too often I see parents buy a cheap quality pack one year, only to purchase a more appropriate and decent one the next. I too have regretted buying cheap gear to only have it fail on me but I have never regretted buying top quality equipment, and indeed am always thankful for it when the weather turns wild. The ability to carry lightweight Cuben tarps and shelters has radically changed the gear and weights that our staff and students now carry on trips. Traditionally we used classic two-person tents for all our school hiking trips. Now we share lighter weight shelters over a much larger group of students. This has also opened up new opportunities for trips, such as those that involve multi-day packraft journeys. Previously our gear was just too heavy for us to be able to carry packrafts, paddling gear, plus all our camping gear and food. Now such trips are not only a reality but are an incredibly powerful educational journey. Going light does not mean less comfort as many people expect. In fact it usually leads to the exact opposite in my opinion. Less weight equals fewer sore feet; it means getting to camp more refreshed and potentially earlier in the afternoon. For me, going light means I can also more easily indulge in a hobby of mine. Now I don’t have to struggle to carry the camera gear that I want to, in order to capture the stories of my students’ and my own adventures. As an avid whitewater packrafter, backcountry skier and thru-hiker, I have certainly embraced a lightweight attitude and discovered a whole range of benefits that this philosophy brings. I hope that the lessons I have learned are now rubbing off on my students and the next generation of outdoor adventurers. The post Lightweight Backpacking for Teenagers appeared first on Hyperlite Mountain Gear Blog.